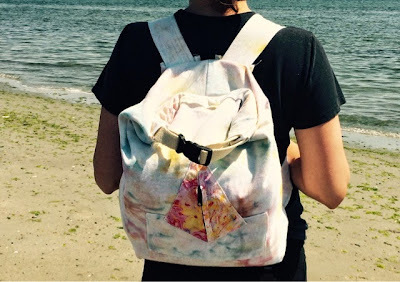 Drawing on my previous occupations for experience or just something familiar, I created a functional, yet fun, beach bag back pack. 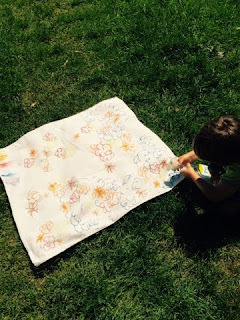 Given that I worked with Sharpies and rubbing alcohol on a daily basis, I was excited to discover this crafty idea to use them in combination, to create a watercolour effect on fabric. 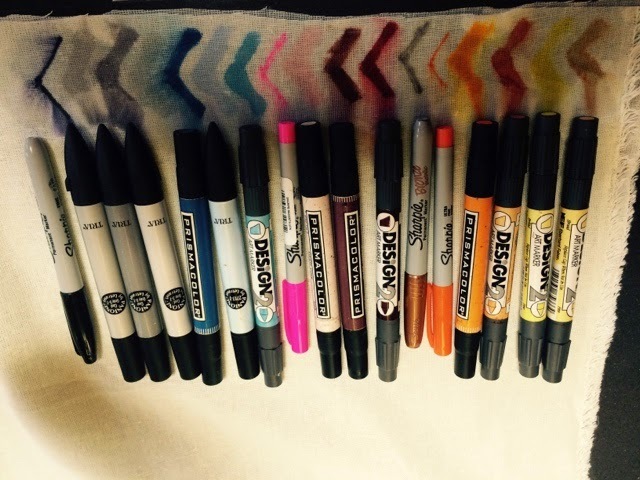 I have a collection of Pantone and Prismacolor pens that I've kept stashed away from little fingers, like a shrine to the days when art was education and toxic fumes were just part of the creative process. Of the array of colours, only the copper Sharpie did not produce the fluid lines when soaked in alcohol. Although my drawing skills leave much to be desired, the process was simple and my children were able to participate. The outcome was soft and whimsical and watercolour like, as hoped. I did,coincidentally, stumble upon a textile designer who's blog and prints are incredibly desirable. Helen Dealtry's recent collaboration with Urban Outfitters resulted in a beautiful watercolour print over-sized scarf and is simply an inspiration for crafty bloggers like myself. In addition to the Sharpie and alcohol fabric treatment, I found another crafty way to marble objects with nail polish and water. I've been tossing around the idea of a marbled print for quite sometime (gold to be exact!) and this quick and easy treatment was perfectly matched to be included as accents on the beach bag. 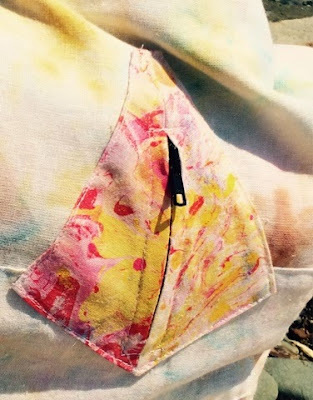 Again the process was simple and my children were eager to participate, and although the source (on Pinterest) did not discuss marbling fabric, the result was fantastic. The photos hardly do it justice. Finally, the design itself, was one of necessity, but also an attempt at an accessory. I am comfortable with the terms functional and outdoorsy, as on more than one occasion I have been employed in the outdoor apparel industry. Plus, residing on the coast, the design of the Dry Bag, with its water-proof roll down closure, seems like a necessity most of the year. Digging into my collection of Fast-ex buckles, D-rings and Tri-glides, I utilized this simple concept, in a slightly non conventional way, with hemp webbing forming the closure. I am incredibly grateful to spend as much time at the beach with my family and friends as I do. Tonight, my son and I counted at least 11 different types of seaweed (as it turns out there are almost 10,000 different types!) while exploring the tide pools. 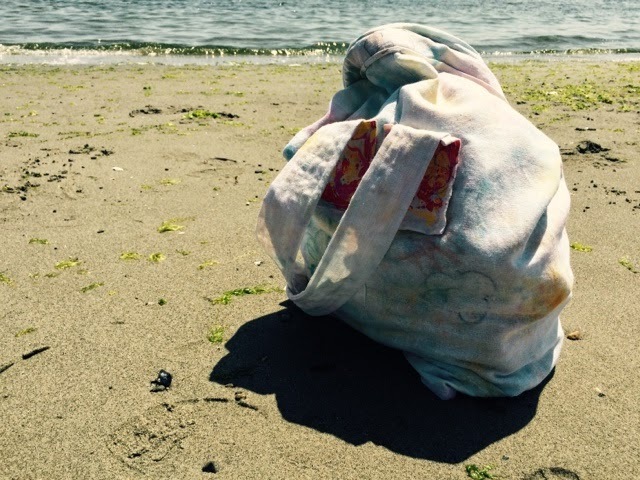 And while photographing this weeks beach bag. 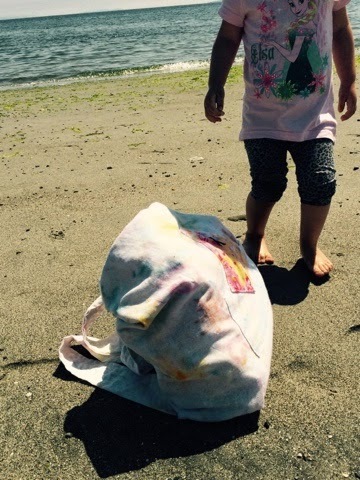 my daughter ran in the sand, sporting her over-dyed cheetah print leggings, a continuation from last weeks discussion on synthetic dyes. I am grateful too, for those of you that read my thoughts, as they spill out onto these pages, and continue the discussion.